The traditional Tahitian-style Lagoon Bungalows at Hotel Maitai Rangiroa are the ideal accommodation if you're looking for waterfront accommodation. 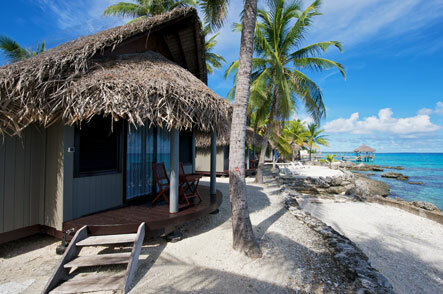 At Hotel Maitai Rangiroa, we have six Lagoon Bungalows all offering a large bed beautifully decorated. The coconut wood is there used as roof to respect the ancient polynesian tradition. 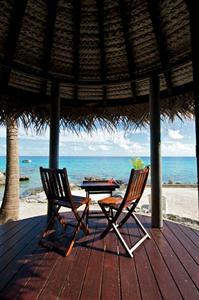 From your bungalow, you see the turquoise waters of the lagoon and all the magnificent shades of blue. Other features of the bungalow include: coffee / tea service, bedside tables, wardrobe, stylish lighting, writing table and chair, ceiling fan above the bed, TV, international direct dial telephone, in-room safe, mini-bar and spacious bathroom with separate shower and toilet, hair dryer and complimentary toiletries are provided. The Lagoon Bungalows at the Hotel Maitai Rangiroa are also equipped with an extra sofa bed that can accommodate a third person. 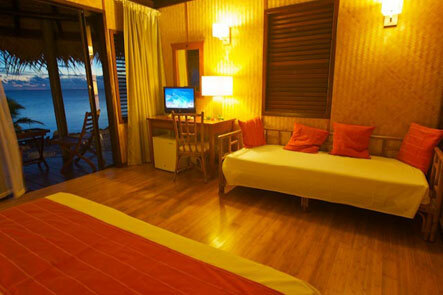 The bungalows are all equipped with air-conditioning, Internet acces by wifi and maid service is provided daily.